This Morning fans quickly tweeted their delight when they spotted chef Isaac Carew on their screens but sadly for many, he as a girlfriend. The This Morning recipe segment of the ITV daytime chat show is very popular with viewers and many of our favourite chefs like to make an appearance. From the cheeky Gino D’Acampo to the hearty James Martin, the chefs always provide inspiration for using the best seasonal ingredients and meals that the whole family will love. 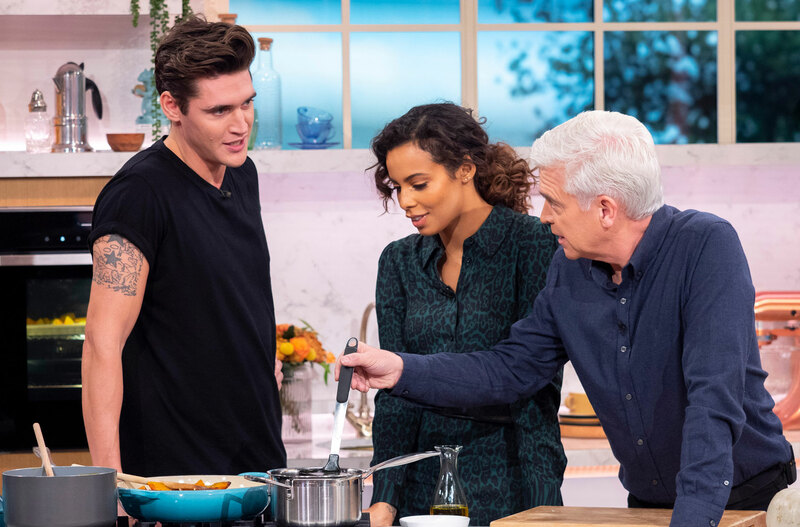 But during yesterday’s This Morning recipe segment, hosted by Rochelle Humes and Philip Schofield, viewers were a little distracted from the food being cooked, as many were focused on the chef instead. Isaac Carew sent temperatures rising during his debut This Morning appearance. He was there to cook up a warming spiced pumpkin soup, because who doesn’t like a big bowl of soup on a cold autumnal evening? Isaac isn’t always in the kitchen however, he has also worked as a model for the likes of Topman and Hermes and his good looks didn’t go unnoticed by the This Morning viewers. One person wrote: ‘Who even cares what he is cooking’. A third joked: ‘So I’ve just caught up with #ThisMorning… Bet @hollywills can’t believe she missed out on the dishy chef! 😂😂’. Some viewers even offered up their dish-washing skills to get close to Isaac. One wrote: ‘Woaah who is this chef on #thismorning Please give me a job in that studio… I’ll even clean his dirty dishes! @thismorning’. Unfortunately for Isaac’s admirers, he’s not in the dating game and is currently loved up with pop singer Dua Lipa. Phil then cheekily slipped in Isaac’s famous girlfriend by asking how good she is in the kitchen. Isaac smiled and said Dua was an ‘amazing cook’.